A fully featured Microsoft Lync/Skype for Business system for your small meeting spaces and huddle rooms, the Crestron RL 2 for Huddle Rooms enables you to extend your Skype for Business communications experience into your small collaboration areas and executive offices to connect people everywhere and achieve more, together. 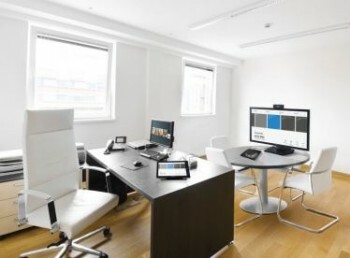 The fully-featured meeting room system enables high quality collaboration on conference room displays rather that laptops. With one touch of a button, anyone can walk into the huddle room and start collaborating. The Crestron RL 2 package for Huddle Rooms provides a complete tabletop Crestron RL 2 system for huddle room and executive office applications. The system can be purchased with a 32″ display that can be placed on a table or mounted on a wall, and the wide angle HD camera and 360 degree speaker/microphone solution enables full view and audio coverage for superior meeting video & audio quality. Audio – With a choice of high performance, low profile USB microphones or professional analogue microphones and speakerphones from the likes of Shure and ClearOne, your system can achieve excellent pickup of meeting participants at a table in your huddle room.